Regardless of the additive manufacturing technology used, as the industry advances consideration of up- and down-stream processes for post-production powder management are becoming more of a focus. This ensures key factors are addressed such as product wastage, operator safety, powder conditioning and traceability. A key part of the powder management process is reclaiming AM powders after a build is complete. Once reclaimed, additive manufacturing powders are blended and requalified. However, a great challenge is how to reclaim and recycle 3D printing powders efficiently. Due to the physical changes that can occur during the build process, this powder cannot simply be reused. The hidden deteriorated and oversize particles compromise the quality of the next build. A powder management system is required to requalify recovered powders after a build is complete. There are many processes involved during this requalification. The first and most critical is to remove the contaminated particles from the recovered 3D printing powder. Due to the wide range of materials used within additive manufacturing - all with very different mechanical properties - this often leads to highly inefficient and labour-intensive processes and contributes to increased costs associated with loss of good product or contamination of powders. Because of this growing need, Russell Finex has applied 83 years of experience in manufacturing sieving and separation solutions to develop the award-winning Russell AMPro Sieve Station™ - the first system of its kind - to ensure a key industry need is met: Guaranteeing the powder handling process is fully controllable, repeatable and with minimal operator involvement. During the conception of this AM powder sieving system, it was important to address the key industry requirements. Having worked within the AM industry since its outset, Russell Finex has built relationships with key partners in all areas of the sector, and the company was sure to utilize this industry knowhow when addressing these requirements, to ensure the Russell AMPro Sieve Station™ meets current and future needs of a rapidly-evolving market. The key is how all functions are incorporated into a one-button operation. The touch-screen is fully-programmable for multiple settings, enabling automatic conditioning of different powders and particle sizes. Once programmed, the operator simply presses one button and can focus on other tasks such as finishing components or preparing the printer for the next build. 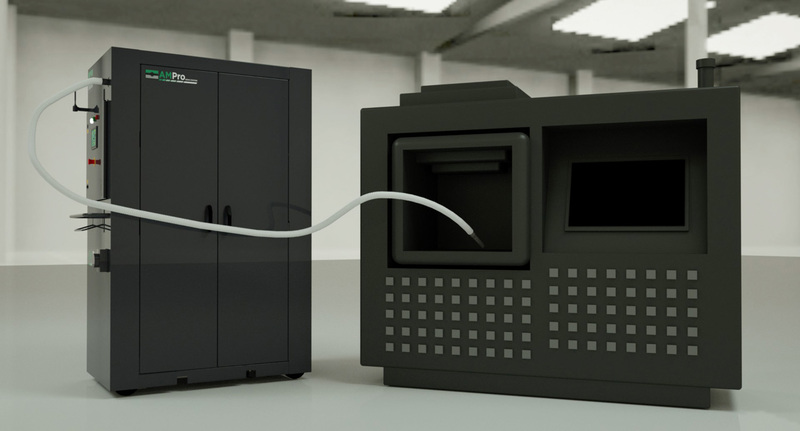 With a compact and mobile design, the system has been designed to fit seamlessly into any additive production process, compatible with powder vessel transfer or as part of a closed-loop powder recovery system. The sieve unit itself is the most advanced element, providing accurate high-capacity sieving of powders, resulting in fast process times. In addition to being easy to operate, Russell Finex has applied extensive experience in supplying to sanitary industries to ensure all contact parts are crevice-free and finished to the highest standard, for fast and effective cleaning. This allows changeover times within 30 minutes, and minimizes cross-contamination risk. The unit is ATEX and ETL compliant, and can be inert gas purged. It is vital that the quality of powders is safeguarded, with a system that minimizes the risk of operator involvement and has the capacity to support full scale production. Ultimately, this system is designed to support manufacturers through conditioning AM powders on any scale, at any stage of the production process. To find out more, contact Russell Finex today.